The latest from Canadian filmmaker Kim Nguyen, following his very good Arctic romance Two Lovers and a Bear and the Oscar-nominated War Witch, The Hummingbird Project is a flawed but mildly entertaining dramedy that is set in the financial sector. The film takes place in 2011 and follows Vincent (Jesse Eisenberg) and Anton Zalesky (Alexander Skarsgård), two cousins who quit their jobs working for a brokerage firm, and hatch a scheme to make money by drilling a four inch wide tunnel from Kansas to New York and running a thousand mile long fiber optic cable between the two points. The privately financed cable will speed up transactions on the New York Stock Exchange by a single millisecond, which they estimate will translate into millions of dollars in extra revenue for them and other traders. But they face a series of roadblocks, including their ex-boss Eva Torres (Salma Hayek), a power-hungry villainess who seeks to derail the project. Much of the film follows them as they chart a path for the cable, trying to make the route as direct as possible, while also struggling to secure the needed land rights to drill on private property. The most opposition comes from an Amish community, who don’t want technology to disrupt to their relationship with the land, and view the project as being fundamentally opposed to their simple, laid back way of life. The point of the cable is to speed things up and make more money, but the Amish are all about living modestly and slowing down from the pace of modern life. This push and pull between speeding up and slowing down is one of the main themes of the film, with the cutthroat corporate world and high stakes insider trading that the characters are involved in limiting their abilities to just enjoy life and spend time with their families. They are so focused on saving time, that they are actually wasting it. The film feels too long at nearly two hours, and it plays with an odd mashup of tones that don’t always mesh together, shifting between corporate satire, tech thriller, mismatched buddy movie, quirky but broad comedy and more serious drama in a way that sometimes feels awkward. 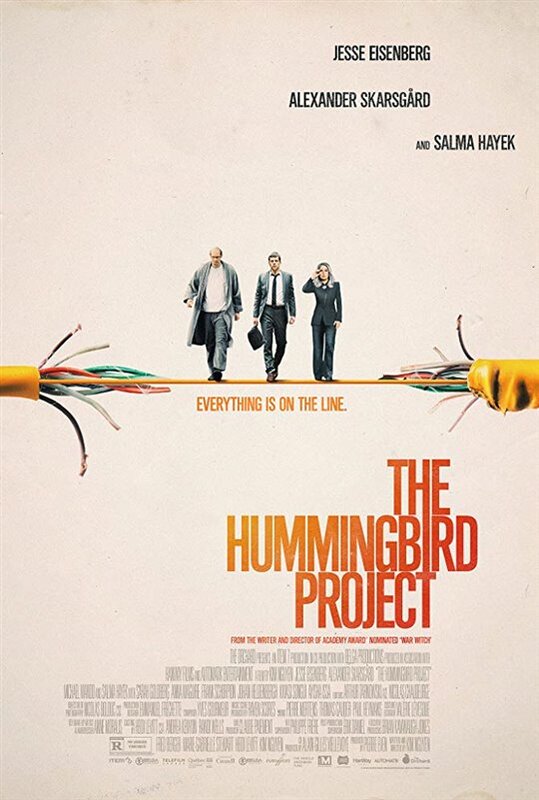 But The Hummingbird Project still has its moments, and the emotional payoff at the end involving Eisenberg’s character mostly works, leading to a bittersweet final scene. Finally, the actors help keep the film enjoyable to watch. Eisenberg is appealing as his usual fast-talking huckster, while Skarsgård is almost unrecognizable as a jittery, balding coding nerd, with both of their characters appearing to be on the autism spectrum. Hayek also has fun chewing up the scenery in a role that was initially written as male, and is groundbreaking for the fact that it went to a Latina actress. The Hummingbird Project is now playing in theatres across Canada.